I have never had the intention to change the theme of the Fullybooked blog. But when unexpected, tedious or even funny events do occur, I give myself permission to make a note which is completely irrelevant to the glamorous party scene of Fullybooked postings. Or even two. Here is the story: you are in your sleepers and PJ's and you have just made a fresh cup of coffee. At this very moment, you realize that you want to check your mail (the real one, arriving in your mailbox, not the digital) so you open the door, leave it unlocked and walk to the mailbox. But the door refuses subbornly to remain open and suddenly closes and you, with a pile of letters in your hands, look at the closed door and can't believe what has just happened. You managed successfully but unintentionally to lock yourself out. With no money, no blackberry and obviously no keys. An experience you may not have had until today. The episode just described happened to me a few days ago. I found myself in my PJ's and sleepers locked between the front door and the my apartment's door, with a few letters, cold air and emptiness. At this moment, and while thinking what my next step would be, I caught myself thinking that it was probably a nightmare, that the door will open, all of a sudden, and will allow me to enter in, have a sip of my freshly made coffee and check my email this time! But no, not a chance. The first effort to ask for help by opening the front door and literary drag the first person inside proved unsuccessful: he couldn't help me and also told me that the only way to enter in the apartment was either my keys or a lock man. Disappointed, I didn't give up. Making sure that I left the front door open (because if not, I would have stayed locked out on a wintry, New York street), and looked for - I don't even know what or who. Despite my good efforts and intentions, nothing proved really helpful. Then, I came into terms that the only way to open the apartment's door was my roommate or a neighbor who would call the landlord. It was 4pm. My roommate returned at 7.50pm. So, how did I spend those precious four hours? Here is my list for some ideas - by all means you get diversify as much as you want. Those are suggestions for the "just in case" scenario (that hopefully won't happen to you). 2. Meditate. Being locked between the front door and the apartment's door, you won't find plenty of things to do. A few moments or hours of meditation, is not a bad idea. You can think of a better present (when you had the keys in your hands for example) and a brighter future. This nice beach in Florida or even Long island does seem very appealing, doesn't it? 4. Find and read old, trashy magazines in the building. You won't necessarily find them in the mail box but they are somewhere hidden. You can catch up on your celebrity gossip, bargain shopping and the latest trends in lipstick. The following day be ready to impress your friends with the latest exercise regime of J-Lo! 5. Take a nap. That helps. It's easy and relaxing. 6. Make a mental to-do list. You don't have a pen anyway. What you should do to avoid a similar situation? 1. Make sure you memorize a few telephone numbers. And I mean it. I didn't know - and still don't - any phone number. If you have a few numbers handy in your mind, you could ask some one's cell phone just to make a quick phone call. Than a friend will show up to your rescue. 2. Hide a set of keys somewhere, safely in the building. Just to avoid similar situations. 3. Finally, make sure that next time, you get the keys with you wherever you go. Even if it is just to get your mail. While writing this posting, I feel so relaxed and happy in front of my laptop and the warmth of my room. Maybe those funny and unexpected events have one major outcome: appreciate the small, tiny moments of the day, those you never "see" or feel grateful for. Like having your keys. For the third year in a row, I attended with a press pass the Italian Gala food and wine expo at the Marriott Marquis Hotel. This year, I also participated in the advanced "Taste of Italy" wine seminar and luncheon. In a seminar that lasted for over three hours, wine experts, sommeliers, wine producers and even Academics specializing in wine presented 26 different Italian wineries from Sicily, Tuscany and the rest of the country. Although not a wine expert myself, I found the session informative, detailed and to the point while wine media had the time to ask their questions. There was a disagreement from the audience when it comes to what is "the best food to accompany the Nero D' Avola", some noise from bored wine editors who would rather gossip than pay attention to the speakers but overall it was an interesting morning for everyone, wine experts and not. The food came in small portions: a selection of assorted Italian Cheeses (that included montasio and piave), grapes, breads and candied walnuts. A small plate with ravioli followed and also rabbit braised with mustard, creamy polenta and porcini mushrooms. The plate of Italian petits fours had to be shared so some didn't have the chance to taste any of those due to greedy and sugar prone journalists. At the following seven-hour tasting open first to the media and then to the public, participants had the opportunity and the pleasure to visit more than 50 wine stations and taste an array of Italian specialty foods like cheeses, breads, olives, olive oils, prosciutto, coffees, chocolates and more as well as a cornucopia of culinary delights prepared by 19 of New York's most renowned Italian restaurants. There was also a fashion show in the evening, an exhibition of early works by Giovan Francesco Barbieri and Vespa scooters on display! Finally, there were drawings for prizes for pre-registered guests, including trips to Italy and a Vespa scooter. What are the food trends? I can't say that I noticed an emerging food trend from Italy. Italians are traditional when it comes to pasta, cheese, breads and olive. However, I will make a "trend's" note for the increasing interest in nutella-type chocolate products (some of which are looking for distributors in the USA). I also noticed the nutella "triangles" (whole wheat bread cut in triangles with nutella on top), a snack that makes the dessert menu of many New York cafés. I love it! Not much to be said about Italian wine trends. Italian wine is a classic. Off-white, camel, coco and black were the dominant colors of the first Mackage Runway Show in New York's Fashion Week. Eran Elfassy and Elisa Dahan kept their collection on the simple side, adding interest with asymmetrical zippers, deconstructed leggings and leather boot covers while selecting mainly leather, wool, fur and cashmere. An elegant, practical and easy-to-wear collection of outerwear, interesting to be seen. 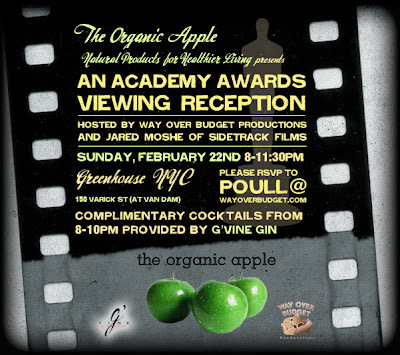 Please RSVP at poull@wayoverbudget.com to be able to attend the Academy Awards Viewing Reception this Sunday 2.22. 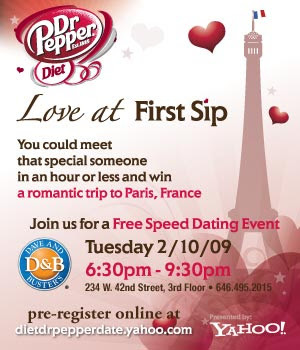 It may be too late to RSVP but you can always try! Sponsored by TheLuxurySpot.com, Elizabeth Grant, and 6 Degrees Magazine, the Ottavia et Emma's New York Fashion Week kick-off party drew over 1500 fans and guests and I was one of the lucky ones. Guests throughout the night enjoyed complimentary Chambord cocktails, OPI/Chambord colored nail polishes and gift bags stuffed with goodies that scream pure luxury, in the buzzing environment at the Cellar. I loved the Ottavia et Emma 100% Organic Cotton Fashion Week IT Tote Bag, stuffed with products including BOBO luxury silk wrapping paper, sandals from Shoes That Love You, all-natural dog treats from K9 Confections, gift certificates for Pinkberry and top celebrity skincare guru, Dr. Alan Bienstock, and Ottavia et Emma’s own 100% Organic Cotton logo tee. Special guests who were spotted celebrating with Ottavia et Emma? American Idol’s Kellie Pickler, CW & Elle Magazine Stylista’s Jason Christopher Peters, and some of America’s favorite personalities from Bravo’s The Real Housewives of New York City and Tony Award winning start Joan Allen , to name a few. Says who that we can't have some fun in recession days? 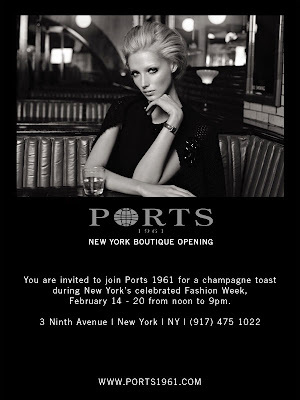 Visit the new Ports Boutique next week for a glass of champagne and the new collection. Where: Tria Gallery, 547W 27th street, Chelsea (between 10th and 11th Avenues). REISS is delighted to invite you to their exclusive shopping event to celebrate the launch of their exciting new spring/summer 09 collection. "Only nine out of ten people like chocolate. The tenth lies". I don't know if this saying is a myth or a personal statement someone one day put in a book. All I know is that I love chocolate and I can't hide it. And if you do too, take advantage of the "Chocolate & I" week in NYC kicking off tomorrow with free samples, free tastings and specialized menus. For more info and for an events calendar visit: http://www.chocolateandi-newyork.com/. I know that I will definitely visit La maison du Chocolat, paying tributes to MarieBelle and make sure I will find time for a Chocolate cocktail at Audrey Cafe. So don't pretend to be the tenth person. Admit it. You do like chocolate and you lie if you say that you don't. InStyle and Aquascutum invite you to a special evening with Michael Herz, Aquascutum's Head of Womenswear Design. Be personally styled and photographed in Aquascutum's new look for the season, the vibrantly coloured Aquamac. Receive an exclusive shopping discount on all purchases made during the event and enter for a chance to win one of five Aquamacs from a selection at Saks Fifth Avenue. 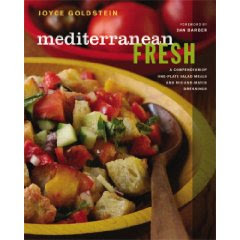 Cookbook author and JBF Award winner Joyce Goldstein's latest title, Mediterranean Fresh, offers a collection of authentic recipes for delicious salads, antipasti, and meze. Goldstein puts her own spin on classics like panzanella, but also includes surprises like tunisian cauliflower, artichoke, and potato salad and a Middle Eastern burger. With an entire chapter devoted to versatile sauces and dressings, there’s the freedom to mix and match mains and accessories. Nimble and casual in its approach, Mediterranean Fresh sends you on a choose-your-own-adventure in the kitchen. The New York Fashion Week is only 12 days away but the Japanese Fashion Week has already kicked off in the Big Apple with a Runway Show Reception on Tuesday, 1.27 at the Altman Building. Although I don't know much about Japanese fashion -with the exception of my beloved from my London days Muji store - I accepted the invitation and I RSVPed. Here I was, in the midst of a buzzy and rather creative crowd looking around trying to find my seat. People were waiting for the runway and I could see anxious eyes and fashion editors jotting down their pre-notes. Finally, the lights were off and the models took over. What I witnessed was a series of sleek, simple and mainly black and white clothes, that I wouldn't mind at all having in my closet. On the whole, thirteen emerging designers from Japan presented a total of 47 looks from their Spring 2009 collections. And for those who didn't have the chance to take a glimpse from the front-row, the runway looks are on display at various boutiques (Destination NY, Issey Miyake, Theory, Aloha Rag, Opening Ceremony and 45rpm) and some will even be for sale. My favorite? The purple/pink long dress from Matohu! For more information about Japan and its fashion, visit: http://www.jetro.org/.